DAWN OF DESTINY is a German melodic Power Metal band, formed in 2005. After two demos (one in 2006, the other in 2007) the band put out its debut album, called “Begins” (2007). This is followed by “Rebellion In Heaven” in 2008. Another year later album no. 3 came out: “Human Fragility”. Live-wise DAWN OF DESTINY has already shared the stage with a.o. SABATON, TANKARD, CUSTARD, HOUSE OF LORDS, PRIMAL FEAR, AXXIS and BRAINSTORM. 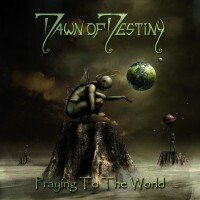 Being signed to the new label Phonotraxx Publishing (like AXXIS and MERCURY FALLING), DAWN OF DESTINY recently (2nd of May) released their fourth studio album under the title “Praying To The World”. This album holds 13 tracks, while the limited edition adds two, “In Another Time” and “Different World”. Needless to say that you do get your money’s worth with a playtime of a good 60 minutes. With the two bonus tracks the 70 minutes are coming closer. It begins with “My Life Lies In Ruins”, a track that sets in instantly in the form of pounding melodic Metal with screams. The verses have dual vocals: clean female and grunting/screaming male, while the music is well-crafted uptempo Power Metal. The hymnic bridge causes a slowdown to let full power and melody come out in the chorus. And catchy it sure is! The guitar solo comes around halfway, followed by a more symphonic Metal intervention connecting neatly with the aforementioned bridge and chorus until the end. All in all, a very nice track to begin with, showing well how melody and power (guitars and drums) go together. “The Right Path” starts with dual vocals only, the chorus line. When the music sets, the take off is not yet there, as the symphonic Metal is being built bit by bit. The verses are melodic (obviously ;-)) and theatrical (clean male and female taking turns), something I like very much. When the growls come in, the music gets darker. It’s also pleasant to hear how the female vocals contrast with the heavy guitarwork in the bridge. The chorus is a slow one, though filled with melodic input (keyboards/piano) and with very good singing. Before the guitar solo sets in, it’s introduced by a violin. And so the song carries on towards the chorus and end. Here as well, no complaints from my part. “Miracles” could have been a TRANS-SIBERIAN ORCHESTRA or SAVATAGE song! The piano intro alone is so damn catchy, add Jeanette’s beautiful voice and *bang! *, this is it! When guitars are added it sounds so like those bands. Add additional symphonics (SAVA-style) and you know you’ve got a killer track! The bridge is of the slow(er) kind, but connects directly with the catchy, straight-forward, melodic chorus with dual vocals (clean male/female). Halfway the song starts all over again (vocals, piano), followed by the Power Metal. Awesome stuff, no doubt. “Place Of Mercy” kicks in in a direct fashion with melodic Metal. The guitars and drums on one side, the piano leads on the other. However, the guitar assists with leading before the verses, which is nice. Once there, it’s all about riffing and Metal! Jeanette clean vocals go well in that contrast. Grunts dominate the vocal department in the bridge, during which the music also sounds more dangerous. Full power, vocals and music, can be experienced in the chorus, where you’ll find great harmonies. A long time over halfway – and I like how they thought of this – the bass gets its moment of glory, backed by symphonic elements. After that it’s Power Metal and guitar solo time, to flow over into the bridge, chorus and so on. The piano serves as closing element. This track made me think of NIGHTWISH meets DARK MOOR meets FAIRYLAND meets … But like before, no complaints from my part whatsoever. Quality assured in “Misunderstood” as well. This is the longest track (07:15). Beginning with vocals only, Jeanette shows she can carry a song on her own. This is very nice, very touching! When the music sets in, it’s like TSO or SAVATAGE with that typical screamy guitar lead. It is like a Rock/Metal opera song, as the harpsichord plays to guide the vocals. Those vocals consists of females and males in a calm setting. Outbreaks are not far off and once the drums fall in, the tempo also increases, the music becomes more powerful to fully blossom in the chorus. Pounding melodic Power Metal with fantastic vocal input! The whole sounds theatrical and massive. I love it! After that, the story starts all over (intro, SAVA/TSO-outbreak, and so on), but then with a chorus that’s a little different and more symphonic. Of course, the guitar solo was not forgotten. Like I said, it’s a long song, which means there’s room to play with the length of the various parts to make it a harmonious experience. Heavenly! “Promised Land” is built gradually via a very nice riff. Firm midtempo Metal kicks in, lead by Jeanette’s vocals. The chorus is where the magic hides: catchy, somewhat Poppy/dancey, with the piano adding extra melodic input. The singing is, as usual, flawless. Speaking of melody, it’s the vocals that are responsible for that, as the music is very much Metal. Later on there’s a beautiful twist with the guitar and bass before returning to the chorus. All things considered, another highlight on this album, without the smallest doubt. “Another Pain” sets in with floating keyboards, followed by metalic bursts and piano leadwork, which dominates in the verses. The bridge is more atmospheric, while the chorus lets out all power and bombast, including dual vocals. This could have been an AFTER FOREVER or TYSTNADEN song, for example. A dark, pounding piece is also added, during which angry male vocals come to the front. Of course, the song has a solo moment as well, which is imperative anyway. Quality remains assured on all levels. While the most tracks are a nice mixture of Power and Gothic Metal, DAWN OF DESTINY opts for an Industrial approach in “My Four Walls”. It sounds like RAMMSTEIN, only lighter. There are effects on Jeanette’s vocals, and wavey/Techno keyboards. The bridge consists of melodic Metal and male vocals, while female ones are in the back. The chorus in straight-forward stuff with dual vocals. It’s nice to hear the contrast between the guitars/drums on one side and the keyboards on the other side. After another heavy bridge, the solo and recurring intro theme, the song is drawn to a end after a few rounds of chorus. Sadly, not all is well, not all songs are as superb as the other. The only example, to me, is “Beast Human”. It begns slowly with the bass and drum. That alone sounds very good. Little by little power and bombast grow in volume. With the added keyboards a haunting touch is created, also in the verses. The bridge is softer, but dramatic, something also indicated by the song title. More drama, including male backing vocals, comes out in the chorus. The bass is overall quite prominent for a dark undertone, together with aggressive male vocals. Another dark piece follows with low, rough vocals in vein of Jon Oliva (JON OLIVA’S PAIN, SAVATAGE, TRANS-SIBERIAN ORCHESTRA), to then make the connection the chorus. But, to be honest, to me this part sounded strange in terms of melodicness, especially when it gets repeated. Halfway the touch of suspense is introduced. Main players are the piano, drums and a guitar solo. The bass remains in position for the main rhythm. Speed increases once more and you feel it will bursts. This can be compared with AFTER FOREVER, EPICA, XANDRIA, NIGHTWISH and so on. Rough male vocals take the lead here. Lots going on here, in any case. “Bleeding Me” – no, not the METALLICA song – is where the band shifts into a lower gear. Slow, sad, symphonic Metal is on offer. It’s not the most happy song, as the title already indicates. The bass is again high in the mix for the main rhythm. Everything advances slowly, the bridge adding a bit of power and melody via the piano. You could see it as a power ballad. However, the chorus is the highlight with full symphonic power. Before halfway another TSO/SAVATAGE influence can be detected. Afterwards the music becomes darker, faster, firmer, bigger. The guitar/drum power is spiced with symphonic accents. All this falls back soon enough to the slowness of before. Further down the track a duet is set, in typical power ballad style. Symphonic carry it all to an end. Time for Industrialism round 2: “One Last Word”. An electronic start with beats. The guitar grooves, again like RAMMSTEIN’s “Sehnsucht” album that comes to mind. Keyboards add melody and it’s like a Dance/House song, but once the Metal sets in, take off has set in. Then it’s all about firm Metal verses where rhythm and groove dominate. Like NIGHTWISH, it sounds melodic in the second instant and full symphonic Power Metal is unleashed in the chorus where two vocalists have taken up the microphone. Lovely stuff! Over halfway the aforementioned electronics and beats return, together with male whispering and clean guitar accents. A melodic transition (is that xylophone?) connects with the verses and so on. Two more tracks: “This Aching Heart” comes in with bursts and takes off like that. Melodic leads are draped over this to faciliate the connection with the powerful verses where the keyboards offer faint backing support. Sort of AFTER FOREVER meets NIGHTWISH meets KAMELOT. The bridge is pounding and slow at first, then ballad-like next. The chorus on the other hand is thundering and bombastic. It is clear that the heavy grooving guitar and drums stand out here. The guitar solo comes in very late, but helps to break the repetition of the chorus. Last but not least there is the title track, “Praying To The World”, that starts with the piano. Low and clean male vocals come in and this sounds a bit like KAMELOT, SAVATAGE, JON OLIVA’S PAIN… style-wise. Firm symphonic Metal kicks in afterwards, while the piano continues to lead. Melodic, Metal-less verses have an organ in the back. More precisely, the Metal is added with the male vocals. Over a pounding bridge one then reaches a slow, melodic and theatrical/musical chorus where two vocalists dwell and take turns. The symphonic aspect clearly stands out. Halfway there’s another, different bridge: dark and haunting with beauty-and-the-beast vocals, so to speak. After the obligatory solo moment and following patterns, the song ends like it began. I had never heard of DAWN OF DESTINY until I got to review “Praying To The World”. This is the band’s fourth album, the fourth time they offer excellent melodic Power Metal with a slab of Gothic. You get a lot of music for your money: 13 tracks, a playtime of a good 60 minutes. And the limited edition adds two bonus tracks. In each song, the band offers enough change and variety to keep you glued to your speakers. It also seems the band is determined to give you as much bang for the buck with each album, as their previous ones (e.g. “Rebellion In Heaven” and “Human Fragility”) also are a good hour long and also contain around 13 tracks. I recently bought these very hard to obtain albums, as they too are very much worth the investment. But back to “Praying To The World”: I can only say… what an album! What a surprise! Even after several listens the magic has not vanished. This is highly recommended and thus definitely one of the best albums this year.